Some might say he was genious, some might say he was crazy, but Paul Gascoigne will always be remembered as a footballer blessed with a rare talent emerges, who, in a moment of brilliance, possesses the capacity to turn a match any time. Playing with Tottenham Hotspurs, Gazza’s injury in the 1991 Cup Final against Nottingham Forest, withdrew the deal about his move to Lazio. The Spurs and Lazio were already agreed to pay the transfer fee of 8.5 million pound. But during his rehabilitation he damaged his knee again, putting the whole healing process back several months. 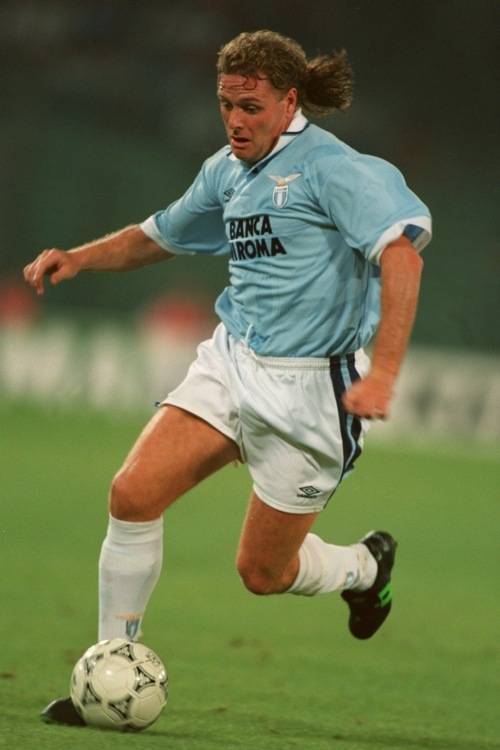 But September 27 of the year 1992, Gazza made his Lazio debut against Genoa. He showed glimpses of his unique and wonderful talent as he adjusted to life in Italy, but didn’t score his first goal until November 1992. Luckily, it came in the biggest game of all for Biancocelesti – the Derby della Capitale, the Rome Derby. His celebration was one of relief and joy and a perfect way to land with a bang in the city. His finest moment was a great solo goal against Piacenza, when he controlled the ball instantly about 35 yards from goal, centrally and zigzagged through the Piacenza defence as they came at him. But Gazza was capable of such audacity – both on and off the pitch. He is legendary for some of his comments, funny faces and pranks. But above all, he was a true genius with a ball at his feet and during his career, he showed the magic at one time or another for every club he represented. Lazio fans still remember him fondly and they look back with joy on his time at the club and think what could have been but for his extended time on the sidelines.